BIG crowds great acts and brillant weather combined to put the stamp of alt="The Manly Daily021008" success on the 25th Manly International Jazz Festival at the weekend. "It's too early to know if we've set an attendance record." artistic director John Speight said yesterday. "But we had the best crowds I could remember on Saturday and our interntional concert on Sunday night was a runaway success with an audience of between 5000 and 6000." Mr. Speight said the rughly league grand final notwithstanding, there wasn't a square seat at the oceanfront venue and jazz fans left standing were packed 20-deep. 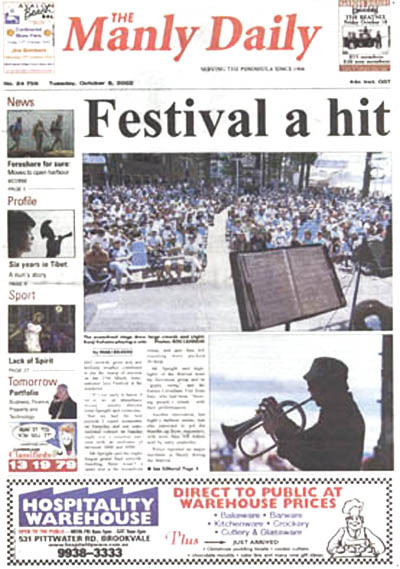 Mr. Speight said high-light of the festival were the Slovenian group and its "gypsy swing" and the Enrico Crivellaro Trio from Italy, who had been "blowing peoples minds" with their performances. Another innovation, last night's harbour cruise, was also expected to get the thumbs-up from organisers, with more than 300 tickets sold by early yesterday. Police reported no major incidents in Manly during the festival.